The northern Mongolian province of Hovsgol Aimag has been the focus of collaborative research, coordinated by the Arctic Studies Center and its director, Dr. William W. Fitzhugh (Smithsonian's National Museum of Natural History) since 2001. In its investigations of the region's connections to arctic cultural history, the Joint Mongolian-Smithsonian Deer Stone Project (DSP) has included archaeological studies of "deer stones" and the ritual contexts in which they are found. Averaging 1-3 m in height, these upright stone slabs are characterized by low-relief carvings of deer with flowing antlers. 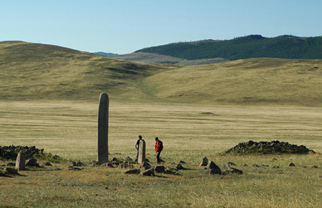 Over 550 have been identified thus far in Mongolia's grassy steppe region, occurring singly, in small groups, or concentrated in larger groupings, often in association with stone burial mounds, called khirigsuur. These monumental features have generally been dated to the Late Bronze to Early Iron Age, approximately 3000 years ago. Geographic isolation has hampered systematic documentation and archaeological investigation, and very little still is known about the deer stones' age, function and meaning within their social, cultural, religious or artistic contexts. Endangered by unprotected exposure to harsh environmental conditions and increasingly by human causes, the deer stones are now considered among the most important - and threatened - archaeological treasures of Central Asia. This has placed a high priority on efforts both to understand and preserve these national icons, and has framed the documentation component being undertaken by MCI. Documenting the deer stones includes photography of all sides with color and scale indication, drawings, condition notes, and, for the first time, 3-dimensional records of individual monuments, all of which are intended to complement the detailed mapping and archaeological data from deer stone site investigations. The priority for the ACP conservation team during the June-July field season was testing a portable hand-held 3D laser scanner for use in the field. This technology allows dimensional and topographic information to be recorded rapidly and accurately in digital format without directly contacting the object's surface. The digital files can be displayed graphically and can also be exported to specialized milling machines to create high-resolution 3D models. 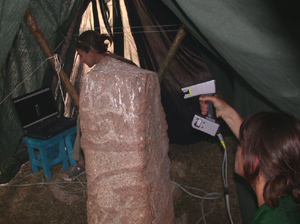 Once the logistical aspects of scanning under extremely rustic conditions were worked out, Rae Beaubien, Vicky Karas and Carolyn Thome were able to scan 10 deer stones at four sites, using locally available materials to construct temporary shade shelters over the deer stones and a small generator to run the scanner and a laptop computer. 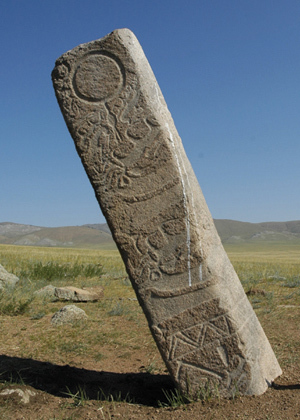 Three of the sites were located around Lake Erkhel, about 30 km north of Muren, the region's major town: Ulaan Tolgoi on the west side, with five deer stones, including the tallest one known to date (3.8 m); and Erkhel North and Erkhel East, with two deer stones each. 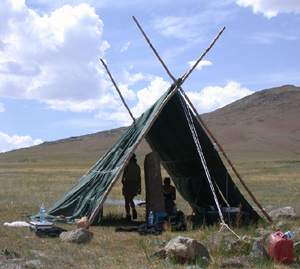 The team ultimately required only 2 to 3 hours to completely scan a deer stone, including the time to set up the shelter and equipment. The post-processing steps necessary to prepare the data files for graphic modeling and reproduction are currently being carried out at MCI. William W. Fitzhugh has published articles about the Deer Stone Project in the Arctic Studies Center Newsletter, at www.mnh.si.edu/arctic under Publications. 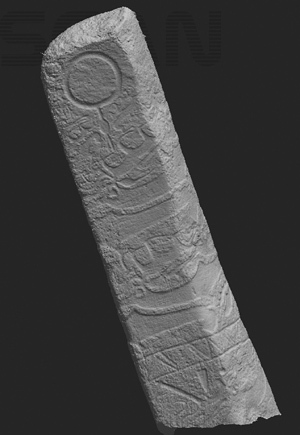 The deer stones are featured in publications by Esther Jacobsen, including The Deer Goddess of Ancient Siberia: A Study in the Ecology of Belief (Leiden, New York: E. J. Brill, 1993).